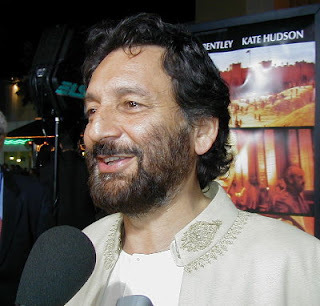 Station Hollywood: Happy birthday to Shekhar Kapoor. Happy birthday to Shekhar Kapoor. The viewers of bollywood films wish happy birthday to Shekhar Kapoor on 6th December, 2017. He was one of the thoughtful directors of bollywood films and still his films are cherished by a big section of the viewers today. He directed a meaningful film Masoom in the early 80s. He used the most dynamic actors and actresses of the contemporary period that was Shabana Azmi and Naseeruddun Shah. Naseeruddin had a previous wife who died leaving his small child played by Jugal Hansraj. He married Shabana Azmi who already had her own daughters including Urmila Matondkar. It was difficult for Shabana Azmi to accept the step son when her own daughters’ interests were related. Naseeruddin Shah decided to send the young child to boarding, but Shabana Azmi’s conscious spoke and she brought him back at the end of the film. RD Burman’s composition titled “huzur is kadar bhi” sung by Bhupinder Singh and Suresh Watkar, and “tushse naraz nahi zindagi” sung by Lata appealed to the masses. Shekhar Kapoor astonished the viewers with a masala film Mr. India in the mid-80s. Anil Kapoor found a device which could make people invisible. He used the device to encounter a big smuggler played by Amrish Puri with the title Mogambo. Anil Kapoor ran an orphanage full of children and after becoming Mr. India used the children in his fight against Mogambo. Anil Kapoor’s compassionate performance, Amrish Puri’s fiery acting, Sri Devi’s dance numbers, everything appealed to the masses and the film ended up being the greatest hit of the year. Laxmikant Pyarellal’s music in the film became super hit including songs like “hawa hawai”, “karte hai hum pyar Mr. India se”, etc. Shekhar Kapoor was criticized the most for his film Bandit Queen based on the life of dacoit Phoolan Devi. Shekhar Kapoor tried to show the torture faced by Phoolan Debi who was a malwa, by the Thakurs of the area, which compelled her to become dacoit. But the film gathered controversy due to the details shown by Shekhar Kapoor in respect of humiliation faced by Phoolan Debi. The Censure Board came in the way. Shekhar Kapoor got criticized all the way. His other film Elizabeth was also a noble venture. Shekhar Kapoor is also known for his acting in TV serials like Khandan which became super hit in the mid-80s. His future projects include Paani, Long Walk To Freedom and The Last Full Measure. The viewers expect Shekhar Kapoor to continue his innovative film making in the years to come.